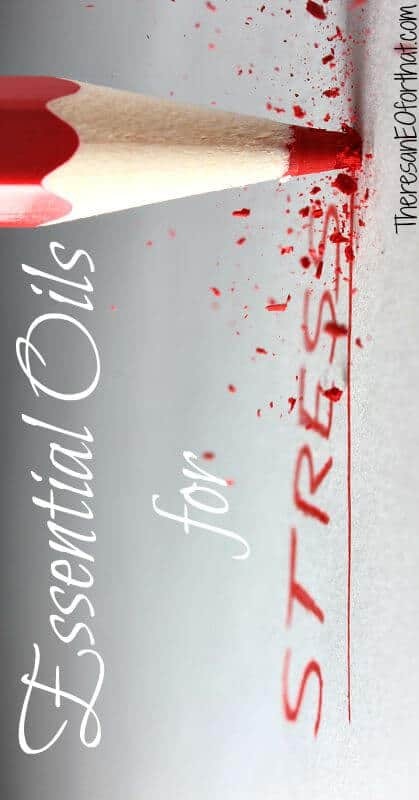 Essential Oils for Stress - There's an EO For That! These days stress is a constant companion. Our relationship with stress is so intertwined it’s immediately noticeable how much relief we get while sinking into a hot bath, take time to meditate, go for a walk, and of course when we go on a relaxing vacation. It has become the shadow that follows us around everywhere we go manifested as the slight pain in your lower back, that mild headache, and the fatigue you’re feeling day in and day out. In fact, so close is our companionship with stress many of us now feel comfortable being uncomfortable. It’s just become normal to be stressed out. It’s sad to think how we overwork ourselves just to earn those extra 3.33 hours of vacation time every pay period. We spend all year dreaming of those 2 short weeks a year (hopefully) that we blissfully get to spend on an exotic island away from it all. In my case, stress has been so rampant and damaging all I can dream about is a staycation on the couch. I really can’t be bothered with planning the details of my day let alone a vacation. To top it all off, stress is cumulative. You can’t just spend 2 weeks on a vacation and expect your stress to be gone like it never happened. It takes more time than that to get our adrenals nourished, supported, and functioning optimally again. A rest helps, but it won’t get rid of the residual stress we’ve accumulated over the years. This often leads to poor sleeping habits, trouble waking up in the morning, and the need for caffeine throughout the day. You catch colds more easily and it takes forever to get rid of them. Your mood hovers more towards the negative end of the spectrum. Your nerves become frazzled and your patience runs thin. You want to be more positive and proactive but you just don’t have the energy. If this sounds familiar then essential oils for stress are going to help you – a lot. How Can Essential Oils Help with Stress? One of the best things about essential oils is you can use them virtually anytime and anywhere you need them. They fit easily into a purse or pocket so there’s no excuse not to have a good blend on hand. Just a drop of the blends I discuss below on the right vita flex points will bring quick relief within minutes. Essential oils not only help alleviate stress because of their intoxicating scent but also because they get absorbed through the skin. They then enter the bloodstream and into the limbic regions of the brain that are responsible for our emotions, our reactions, and our moods. Essential oils give your body the uplifting boost it needs during stressful situations and in doing so, immediately imparts positive emotions. Check out the video below to see how an essential oil can affect our blood. It’s pretty neat to see how influential they can be on our bodies! Stress comes in many forms and it’s important to know which kind you’re dealing with so you know how best to control it. This type of stress is usually caused by things like too much coffee, tea, sugary drinks, alcohol, medications, junk food, and inhaling pollution like work environment chemicals, perfumes, and cigarette smoke. These chemicals stress the body by overburdening the liver making you feel more and more fatigued over time. The vast majority of us fit into this category and it’s because we’re human by nature. Emotional stress is caused by relationship issues, sadness, grief, feeling overwhelmed, anger, guilt, jealousy… all those extreme feelings that make us worry or dwell. Stress can also be caused by overt positive emotions too like extreme excitement and anticipation. This category of stress can leave you feeling beside yourself and emotionally exhausted. A lot of the time this type of stress comes from an environment you don’t have much control over like an office. There might be too many fluorescent lights, loud noise, too much chatter, phones ringing off the hook, clutter, or a space that is too cramped. Many people who deal with this type of stress become irritated easily or are overwhelmed by the environment they are in. Mental stress comes from the desire to do well or to do better. It is often a result of studying hard for exams, trying to achieve a goal, worrying over life situations like finances, marriage, a birth, or other major life event, and anguish over not having enough time in the day. This type of stress encourages us to burn the candle at both ends. People with mental stress are often very tired and feel totally burned out by bedtime. Physical stress is caused by pushing your body to the limit whether it’s from working out, playing sports, outdoor activities, impaired physical ability, having an old or new injury, or even just sitting in traffic for long hours. People who have this type of stress may have joint pain, sore muscles, or other physical problems that affect their day to day life. The category (or categories) you fit into will determine the best essential oils to use. I’ll be writing more in-depth about each type of stress and the best essential oils to use for each one in the upcoming articles, so stay tuned! For today I’ll touch on the most important essential oil support you can give your body during times of stress- adrenal support. All types of stress affect the adrenal glands in one way or another because they’re so interchangeable. Strong emotions can drain your energy just as deeply as physical exertion. The best way to combat adrenal burnout and help us react to stress in the best way possible is to use essential oils like a shield against negativity. • Carrier oil of choice such as sweet almond, fractionated coconut oil, grapeseed, jojoba, etc. Don’t want to make your own? Get Adrenal Blend here. As you may have noticed, rosemary essential oil plays an important part in supporting the adrenals. Simply smelling rosemary essential oil for a moment will reduce cortisol levels so if you have nothing else, get rosemary essential oil! To make a quick roll-on for rosemary just add 44 drops of rosemary essential oil to a roll on bottle and add enough carrier oil to fill the rest of the bottle. You can apply any of these blends over the adrenals 2-3 times per day for best results. 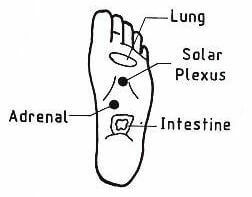 Here is a picture below to give you a better idea on where the adrenal glands are located. A single swipe of the roll on over each adrenal gland is all you need. Rub it in if desired (especially if you used a heavier carrier oil) to help keep it off your clothing. Another great place to apply your blend is on the vita flex points of the feet. Apply a swipe of oil on the vita flex point and then press firmly while rubbing it in. Look below to see where that is. You should feel results after just a few days. As soon as you feel stress edging its way into your day or you are anticipating a stressful situation swipe on the adrenal blend you chose to make. 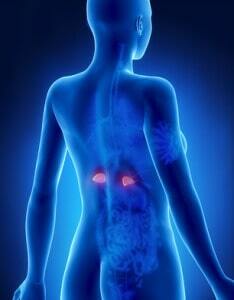 If you’re at work or are in a public place it can be difficult to reach the adrenals by yourself. I have found that the best way to apply the oils in these situations is to go to the restroom, apply a swipe of oil on my fingers and then reach up the back of my shirt to rub it in. It takes some practice but you’ll get the hang of it. If this isn’t a feasible option just be sure to apply your blend before leaving your house for the day. What are your favorite essential oils for stress?